As regular readers will know, we like to keep an eye on digitised newspapers of a general nature, as well as digitised film journals. 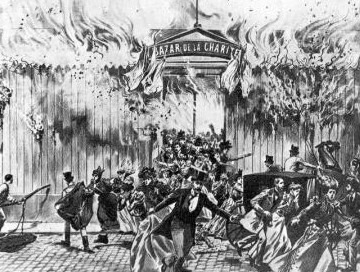 Newspapers are where cinema was reported to a general public, and for the medium’s earliest years it is through newspapers that we can trace not only names and events but an idea of presence, of the progressive encroachment of moving pictures upon the public consciousness. An increasing number of silent film scholars, notably Richard Abel, are making extensive use of online newspaper archives and helping change our understanding of early film history in the process. We have reported on the many newspaper digitisation projects to be found across the web, bringing together information on the key resources into a single Bioscope post. 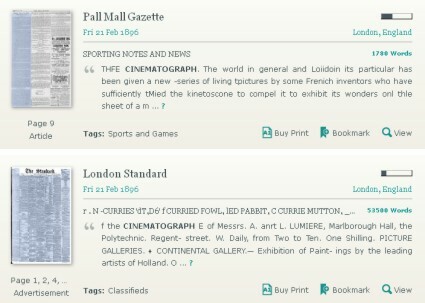 Today a new digitised newspaper collection was announced, with considerable palaver, and rightly so. The British Newspaper Archive is extraordinary. It is the first expression of a ten-year project between the British Library (my estemmed employers) and brightsolid, a family history business, which will eventually see 40 million newspaper pages published online. Version one offers a mere 3,079,053 pages (as of today – 8,000 new pages will be added each day), from the whole of the 19th century (content which is comfortably out of copyright) plus some of the 20th (where a few licences have been agreed). Though most of the newspapers covered date 1800-1900, some go back to 1700, and the most recent year covered is 1949. The British Library already has its British Newspapers 1800-1900 site, which offers some two million pages from 49 local and national UK newspapers, available by subscription or for free if you belong to a subscribing UK university. The British Newspaper Archive widens the amount of regional newspaper content hugely (while incorporating the earlier resource’s content), drawn from 175 journals – ranging from The Aberdeen Journal to the Yorkshire Gazette. It doesn’t come free, however. The deal is that the content is avaiable under subscription models online, and free onsite at the British Library. Searching online is free, but viewing the documents comes at a price. If you get a 12-month subscription, at £79.95, you get unlimited access. 30-day (£29.95) or 2-day (£6.95) subscriptions are available, giving you 3,000 or 500 credits respectively, with views per page ranging from 5 to 15 credits per page. It’s an idea to search first to make sure that what you are looking for is really there. Once you have paid, the resource available is outstanding. Searching, advanced search options, browsing, filtering, viewing, presentation, analysis, annotation, OCR, tagging, bookmarking – everything has been thought of and presented in a state-of-the-art fashion. Just seeing the newspapers reproduced in colour rather than greyscale is such a pleasure. The British Newspaper Archive is aimed at the genealogy market first and foremost, but there is so much here for the film scholar as well. Inevitably, given the emphasis on the 19th century, it is mostly the very early years of film that can be explored. Our regular test search term demonstrates what lies in store. Typing in ‘kinetoscope’ gets 902 hits, 725 from 1894-1899, 11 from 1900-1944. The earliest reference comes from the Exeter Flying Post on 10 March 1894. Typing in ‘cinematograph’ brings up 9,032 hits; ‘bioscope’ scores 1,634; ‘movie’ gets 13,132. Having the musical hall and varety journal The Era (for the period 1838-1900) is of particular importance, because it reported so extensively on motion pictures for the early years. 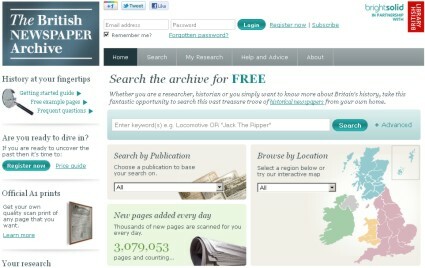 This is going to be the major resource for discovering newspapers from the national collection from now on. It doesn’t include the leading titles, such as The Times and The Guardian, which have been made available separately by the newspapers in question. But it will be so extensive, and comes with such useful search and discovery tools, that it seems bound to lead the way. Eventually it must move into the 20th century (as it has a little already), if licences for use can be agreed with the copyright owners. It is, I think, the second-best online newspaper archive now available. The best? That’s New Zealand’s Papers Past. Which is not only the best as the complete research resource (see the Bioscope’s 2008 review), but its two million pages come free to all. Sigh. Save up, then go explore.